Opened in 2009, Viceroy Snowmass, a 152-unit ski-in/ski-out residential hotel and resort, was intended to be the crown jewel of the new Snowmass base village. While the surrounding village has been slow to develop, Viceroy Snowmass still lays claim to being the finest luxury resort in Snowmass—the second largest ski resort in Colorado and a world-class destination that caters to every member of the family, year-round. The hotel blends the contemporary styling of other Viceroy properties with an organic Colorado high-country charm that effortlessly brings warmth and a sense of comfort to the only LEED™ Gold certified luxury property in the state. Climbing the road up to Snowmass Village, Viceroy Snowmass is the first and largest building you see, it’s stone and wood exterior naturally blending into the beauty of the ski resort behind it. As you wind around to the valet stand, say “goodbye” to your vehicle because you won’t need it during your stay; the Assay Hill ski lift is just steps from the property, the open-air electric “Luge” will shuttle you to the base village and a fleet of white Range Rovers are ready to whisk you to wherever you need to go. 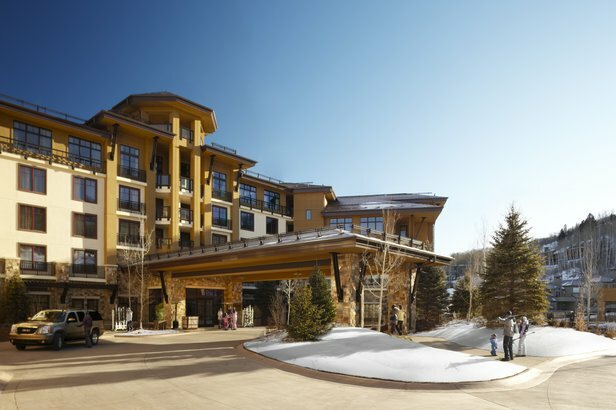 Viceroy Snowmass’ LEED™ Gold certification, awarded thanks to a commitment to sustainability, is immediately on display upon arrival—from the electric car charging station next to the valet stand to the reusable steel water bottles given to each guest at check-in. The stunning lobby unveils renowned Architect Jean-Michel Gathy’s contemporary organic mountain aesthetic with design features like the cylindrical, glass-enclosed fireplace in the middle of the room, the birch tree wall wrapped with copper and leather, and the large tree trunk anchoring the reception area. Upon check in, your bags will be taken to your room, while your ski equipment is transported to the Ski Concierge until you’re ready to hit the slopes. En route to your room, take a peak into Eight K restaurant, bar and library—the stunning Roaring Fork Valley views and dramatic 87-foot glass-topped bar are quite the site to behold.